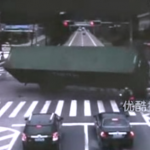 A motorcyclist in Linhai, Zhejiang province is lucky to be standing today after barely avoiding an overturning container truck last Tuesday. Check out this recently uploaded video in which the cyclist, waiting on Highway 104, finds the sudden need to sidestep a 19-ton vehicle skidding straight at him. The truck driver, fortunately as well, was not seriously injured. 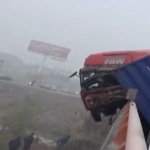 A 20-car rear-end chain collision yesterday morning on the Hang-Pu Highway between Hangzhou and Haining, Zhejiang province resulted in two dead and at least eight injured. The Jiaxing (prefecture-level city in Zhejiang) Fire Brigade said there was a "thick fog" at the time of the accident, and visibility was further hindered by smoke from burning stalks. 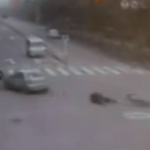 A minor traffic scrape yesterday at 10:40 am in Shanghai led to vehicular homicide. 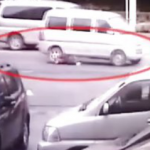 Around the intersection of Keji and Yuanmen Road, after a van and a cab bumped into one another, the cabbie exited his car to confront the other driver. The guy in the van, who wanted none of it, stepped on the gas pedal. 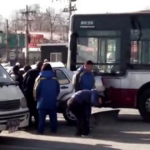 The van's front wheel ran over the cabbie, who was then dragged 10 meters under the carriage. Near Anshun, Guizhou province on Saturday morning, a traffic accident -- possibly a head-on collision -- resulted in massive fender-benders going both directions. On one side, 44 cars got tangled up; on the other, 25 cars. All told, 25 were injured and nine died. Traffic didn't return to normal until eight hours later. 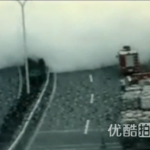 A 69-vehicle accident indeed seems insane, but in China, it feels like business as usual. 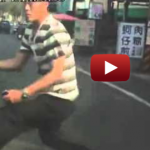 A man walking through the street almost had the misfortune of having a car fall on his head. 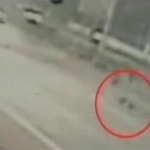 Or look at it this way: he was lucky enough to have not been killed by a car falling on his head. See? So much better to see the glass as half full. 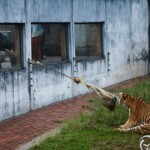 Here's a guy who, metaphorically, gets his hand caught in the cookie jar. We only wish his hand could've been chopped off (metaphorically, of course). 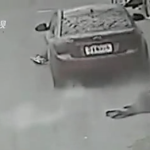 In Kaohsiung, Taiwan on Saturday, a dude crouching on the road leapt up and rolled himself onto the hood of a vehicle he thought was going sufficiently slow enough to not kill him. We imagine this is the conversation that followed: "OWWWwww. Owwwwww. GAWD WILL I WALK AGAIN?!" 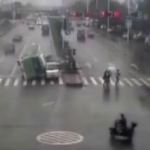 In Hangzhou, Zhejiang province, surveillance cameras recently caught this perfect storm of an accident involving a motorized three-wheel wagon and a bicyclist. 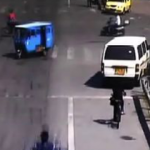 The man driving the three-wheel wagon swerves and loses control when the bicyclist cuts in front of his path. Neither saw the other coming due to another trike that was in the exact wrong spot in the intersection. 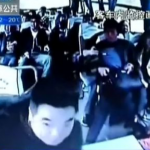 A bus in Shanxi province, time unknown, flew off the road and into a ditch more than two meters deep, flipping at least once along the way, killing three of the 24 passengers, two of them instantly. Want to see what that looks like? Great! Look at the above video. 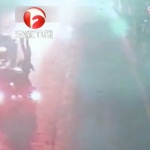 On Tuesday at the intersection of Airport Avenue and Pujiang Street in Wenzhou, Zhejiang province, a bus lost control on a slick road and rammed into a Nissan parked in another lane. There were no serious injuries, but let this be a reminder to everyone that roads are not safe, and much less so when it's been raining. The driver of an unlicensed taxi in Shanghai who ran over a German this summer had his day in court yesterday, getting sentenced to three years and three months in prison, according to Dongguang News. 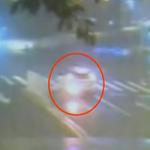 But first, to the recently released footage: Around 3 am on July 15, a German named Sasha and two friends got in an unlicensed taxi operated by Wang Mou. 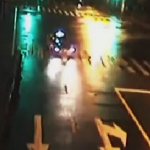 On Saturday night in Taichung, Taiwan, a drunk man surnamed Zhang wandered onto a busy road, sat down, and passed out. We've seen drunk people on the highways before, but not what happens next. After about four minutes -- a dozen or so cars had zipped by without stopping to help, with only a couple slowing down -- a vehicle ran him over. 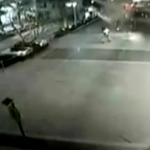 You can see all of this in the surveillance footage, above. The car that hit him ended up flipping onto its side, though the driver suffered only minor injuries. We have some good news and bad news. First, the bad: from September 30 to October 7, called "Golden Week" because everyone is on national holiday, accidents on the road in China "killed altogether 794 people and led to direct economic losses worth 13.25 million yuan (2.1 million U.S. dollars)," according to Xinhua. 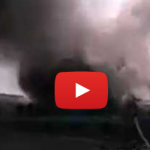 We've seen plenty of truck explosions in our time, as recently as last Wednesday. When they involve tankers of the LPG variety, bad results usually ensue. Take note: the accident in August that killed 36 in Shanxi; an oil tanker crash in June that left a city in smoke; a fiery death at the rear of a liquid petroleum truck; and so on. All told, the lesson is pretty clear: tankers explode, and explosions kill. 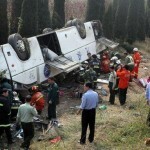 We now know that the bus that crashed on the Beijing-Tianjin-Tangu Highway on Monday, killing five German passengers and one Chinese, was carrying a delegation of doctors and medical students from southern Bavaria. There were 19 German tourists plus their Chinese tour guide and driver. The accident occurred when the bus apparently rear-ended a large shipping truck. 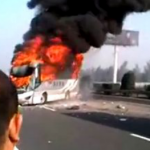 Once the bus caught fire, there was really nothing anyone could do except run from the flames.